This is an old YouTube video that I’ve been wanting to blog for a while. 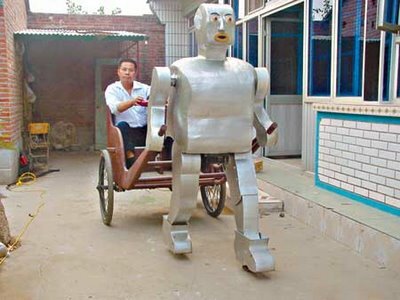 Over in Tongzhou, there is a farmer who makes robots despite a lack of any formal training. He loves making robots, but his wife is not so fond of them, especially after Mr. Wu burned down the house. On the flip side, she says at least he’s not drinking or chasing women, just making robots. For the farmer, from Tongzhou, China, is a part-time inventor who creates ‘labour-saving robots’ out of scrap he finds at rubbish dumps. His brain-children – all developed during long nights spent in his garden shed with only his imagination as a guide – include Number Five, a one-metre-tall humanoid robot capable of walking, changing light bulbs, lighting cigarettes and pouring tea.A newer model named Number Six is a monkey-like robot with magnetized feet which enable it to crawl slowly up metallic walls. The backyard scientist has also produced a miniature frog-shaped robot that hops, and a giant, walking eight-legged trestle table capable of carrying two passengers. All of Mr Wu’s inventions are fashioned out of welded-together metal, duct tape and second-hand batteries. Here is a terrific video with British comedian Paul Merton. While visiting Beijing, Merton thought it was more interesting to go visit the robot farmer than go to the Great Wall, and frankly, I have to agree. Watch the video to the end, there’s a wonderful moment when one robot clanks by the door. I’m tempted to visit myself now; Tongzhou isn’t that far away from where I live, and who doesn’t want to see robots? 7 Comments on "mr. wu of tongzhou: farmer, robot creator"
did you manage to locate this guy? i’d be interested in interviewing him. please send me your e-mail. Very cool! I wonder if he would mind people going and visiting him all the time though? I certainly have to agree with you and Merton that it would be much more interesting to visit this man and his creations that the great wall! Would love to know if you have located him or not and whether it’s feasible to just visit without an invitation..
Duct tape may be the single greatest invention ever! when combined with ‘second-hand’ batteries the possiblities are limitless. Thank you Mr. Wu you have insipired us…. we really like your blog, if you want to do a link exchange it would be great. this is the best thing i’ve ever seen. thanks for posting. I have no idea how I stumbled upon your blog but I’ve just bookmarked it! I’ve never been to China (save for Shenzhen via Hong Kong) and now I have a tingly desire just to visit all the interesting places you blogged about in Beijing!!!! Do his robots booze and chase women?